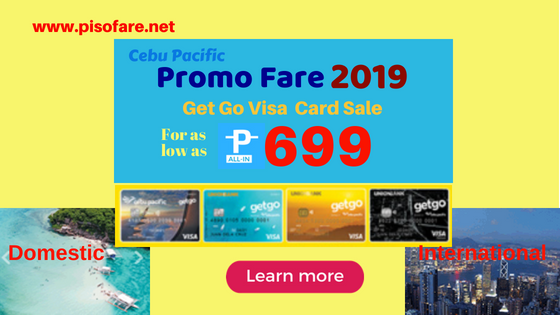 Book your January 1 to March 31, 2019 trips via this new Cebu Pacific Get Go ticket sale! The Cebu Pacific promo tickets on this sale can be availed by using your Get Go Visa Card. Use the Promo Code: UBPGETGO when booking. Enjoy as low as P699 Cebu Pacific promo fare to select domestic destination. Flight to international destination starts at P1,199 per way. Many local routes and foreign places are included in this sale. Grab this opportunity to fly to your desired destination with the affordable fares of Cebu Pacific. Booking for this seat sale is only 2 days, June 12-13, 2018. So, if you are interested in the low fares, book fast. Sale tickets are on limited availability and on a First Come, First Serve basis! Check this sample ticket booking of Cebu Pacific promo ticket Cebu to Kalibo/ Kalibo to Cebu below. Book promo tickets at www.cebupacificair.com where you must enter the Promo Code: UBPGETGO. Booking for the promo is exclusively thru online booking. Payment of tickets should be made via Union Bank of the Philippines Get Go Card. Do you need more promo fare and travel updates? You may receive promo notifications by following us in Facebook: PISO FARE TICKET! Can I use a different visa card to buy piso fare, instead of the get go card to get the discounted rate?